Polling For Change at NRHA is Showing Horse Enthusiasts Want Change. 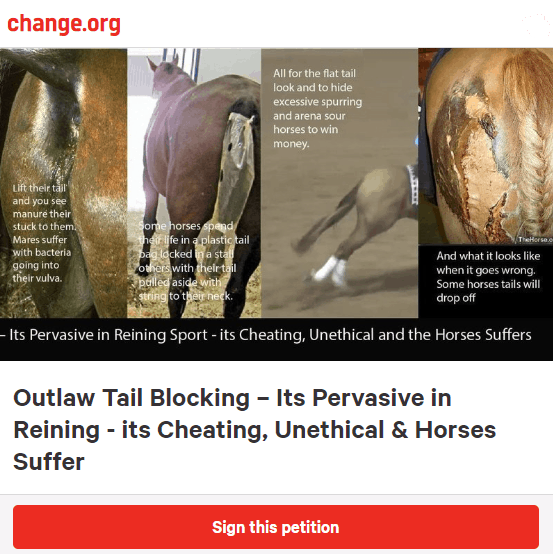 The reining horse and horse community at large have growing concerns for the welfare of the reining horse. A sport that an ever increasing level of welfare issues and training concerns with little to no oversight by the board of directors and executive. PLUS: excessive spurring to the point of drawing blood, excessive jerking of the reins relentlessly, over bending behind the vertical for extended periods of time, spur holes in their shoulders and sides, tying around in boxes for extended periods of time, being left without water for 24 hours before competing, being tied high in stalls to tire the horse and avoid unnecessary movement that will cost points, hocks and joints blocked to avoid disqualification for lameness, and the list goes on. The Rule Book is rarely enforced as the perpetrators are the trainers and potentially board members or friends. The show managers, stewards and marshals are ineffective and often the designated people are the ‘good ol boys’. The Poll is showing how those outside the reining bubble are seeing the sport. Is this the new Tennessee Walking Horse Big Licker? VOTE NOW AND SHARE !! !